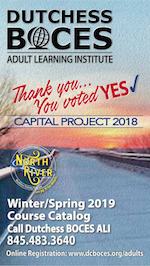 Dutchess BOCES Adult Learning Institute’s Winter/Spring 2019 Catalog is now available online. Please call with questions - 845-483-3640. We would be happy to assist you!